Bruce Springsteen has been nominated three times for the 2016 Billboard Touring Awards. 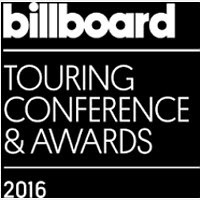 Based on tour receipts from October 1, 2015 to September 30, 2016, the awards not only salute the touring artists but also executives, promoters, companies and venues. Springsteen and his E-Street Band are up for Top Draw and Top Tour, both of which are against Beyonce and Coldplay, and Top Boxscore for an appearance or series of shows at a specific venue where they are up against Coldplay and the Stone Roses. Among other veteran artists, Kenny Chesney is nominated for Top Package for his Spread the Love Tour with Miranda Lambert, Sam Hunt and Old Dominion. Guns N' Roses Not In This Lifetime Tour is up for the Concert Marketing and Promotion Award. Finally, Bon Jovi has been selected for this year's Legend of Live award. The awards will be given on November 9 at the SLS Hotel in Beverly Hills, CA with Brian Dunkleman hosting. Coachella Valley Music & Arts Festival, Indio, Calif.
Stagecoach Music Festival, Indio, Calif.